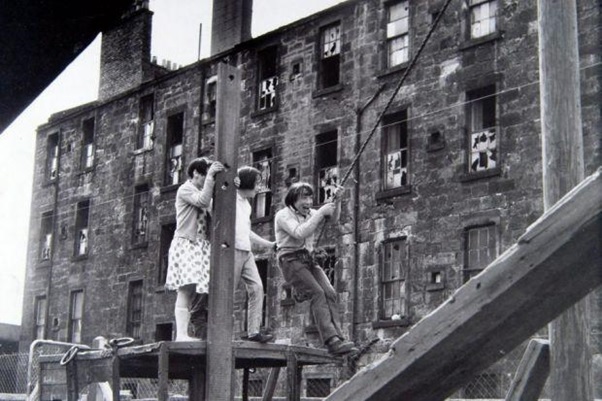 Did you live in a high flat in Glasgow in the 1960s and 1970s? Where did you play? 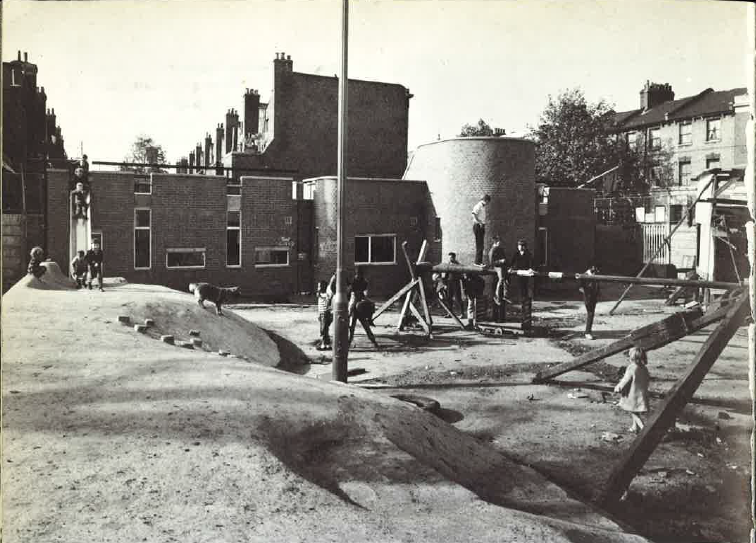 If, as discussed in Part 1, Le Corbusier did not influence architects, construction companies and City Corporations/Councils to incorporate child-centred facilities in to high rise housing in the UK, the question is what provisions were made and where did children play? 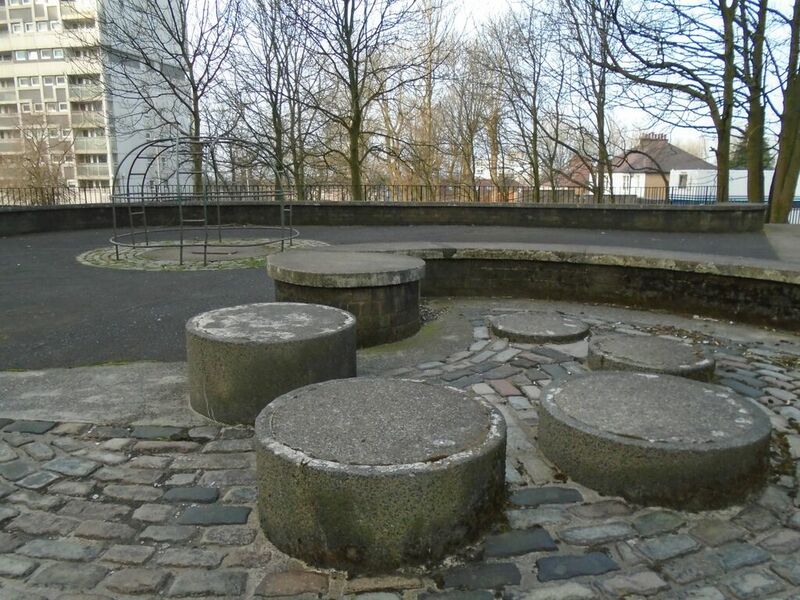 Well, inside the blocks there were few facilities, if any at all, provided for children’s play when the flats were first constructed. So if it was rainy children played in the halls, lifts and entrance halls. This was obviously noisy and many neighbours didn’t like it, not to mention the caretakers. 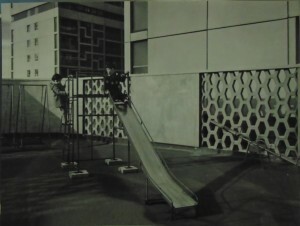 In his critique of the Spence blocks at Queen Elizabeth Square in Architectual Review (November 1967), Nicholas Taylor states that ‘there can be few signs meaner or more pathetic than children of four or five finding what room they can in the upper lift halls as a playground’ (p. 348). Although I’ve heard from former residents that they loved playing in the halls at Queen Elizabeth Square where the kids held their own art exhibitions and concerts – with some floors being more welcoming than others. 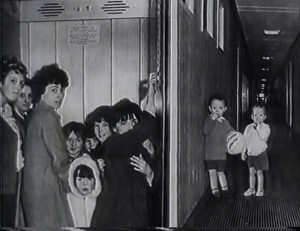 Children also played on the balconies or verandahs but some mums worried about how safe this was. In Queen Elizabeth Square, I’ve been told that kids used to sit up (or even walk along) on the concrete wall of the verandah as there was a wee ledge. 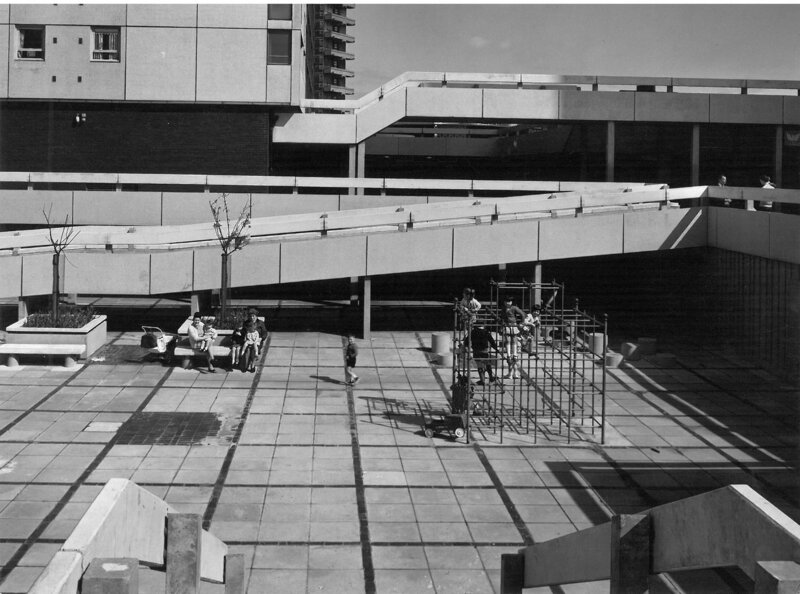 However as Part 1 showed, the balconies at Queen Elizabeth Square were big enough for riding bikes, playing football and all sorts of other games. Some people even had wee huts for the kids to play in. 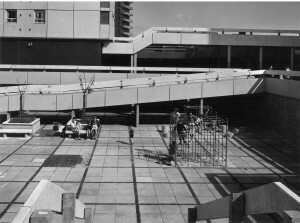 Later, in the late 1960s and 1970s, as it became increasingly clear that local authorities were not going to provide facilities, or didn’t have the money or resources, attempts were made by groups of mothers, sometimes with the help of the PreSchool Playgroups Association, to use community rooms in high rise blocks for play groups for the under fives. Pearl Jephcott and her research team also tried to help some young mothers in Royston to establish a play group in Charles Street High Flats which was eventually taken over by the Save the Children Fund. I’ve also been told about community run facilities for children and young people in high rise blocks. 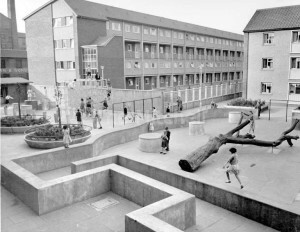 During post-war reconstruction there was a renewed emphasis on the need for children to have designated space within the city that was theirs. 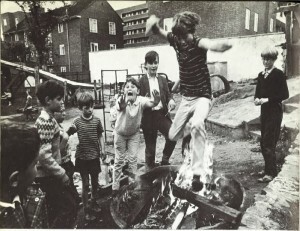 The role of the child in the city was changing. Streets were no longer considered a safe place to play. 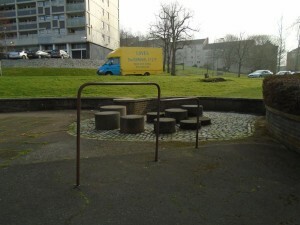 The solution was specially designed play grounds to cater for children of different ages. Here children could avoid traffic. As car ownership grew in the postwar years so too did road traffic accidents and incidence of injury and fatalities. 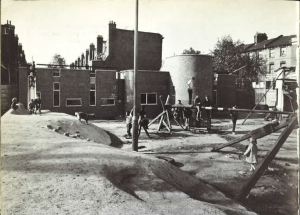 It would appear that perhaps Le Corbusier’s ‘New Brutalist’ aesthetic influenced the design of playgrounds built in post war housing estates in the UK. 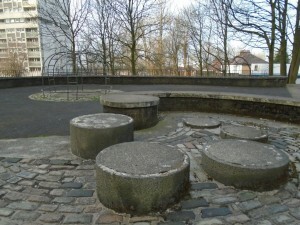 Similar styles of playground could be found in the Gorbals and elsewhere. The playground in the following photo was referred to by the kids that played in it as ‘the jumps’ and it is well remembered by those that played there. The Gorbals also had an Adventure Playground. 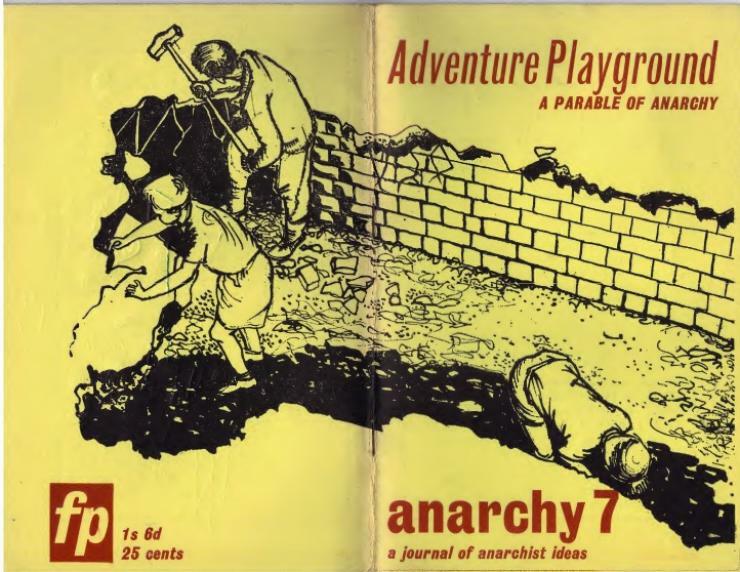 Adventure or ‘Junk’ Playgrounds were first established after the Second World War, often on bombed sites in inner cities. The movement began in Denmark, and Lady Marjorie Allen is credited with bringing adventure playgrounds to the UK when she established the first in London.